Who says beer can’t be for breakfast? 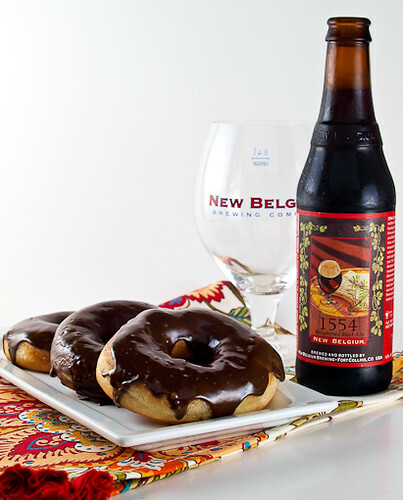 The folks at Foodbuzz joined with the New Belgium Brewing Company to offer a group of bloggers the opportunity* to create a recipe using their fine, fine beers. I have been a New Belgium fan for as long as I have enjoyed beer. I even own a few New Belgium beer glasses, so getting to create a recipe with their beer was just the antidote I needed to the Pie-pocalypse of the last few weeks. The first thing I decided on was the beer I would use. My favorite New Belgium beer is the 1554 Enlightened Black Ale because of its robust, smoky flavor. I knew it would be perfect in a sweet application but I did not want to make beer cake or beer bread. 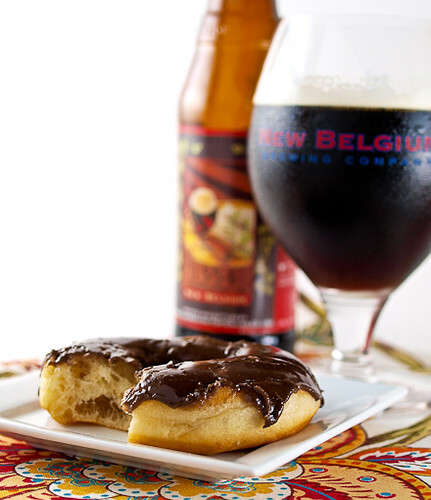 Then I had a thought … what about a beer doughnut coated in a beer spiked mocha chocolate glaze? 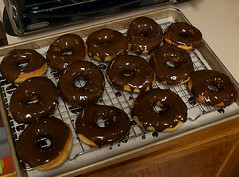 Giddy with the idea of it I went home and fried up a batch of doughnuts with a unique, unexpectedly complex flavor. How did I use the beer, exactly? 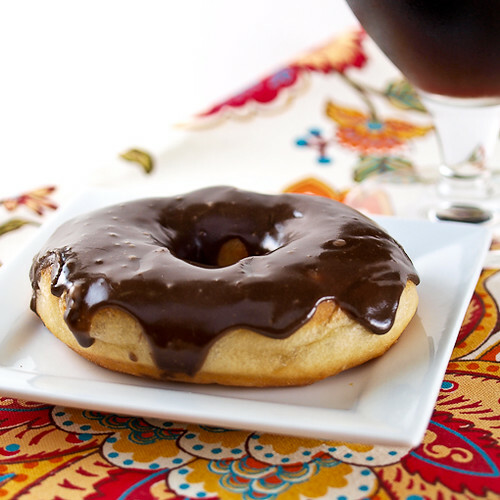 In the doughnuts I substituted the water for the Black Ale. There is not a lot of liquid in the recipe so the overall effect of the beer is to punch up the yeasty flavor in the dough. The beer really comes into play in the glaze. I used a mix of 60% Black Ale to 40% espresso along with Dutch-processed cocoa powder so you really taste and smell notes of bitter smoke and chocolate. These are good for breakfast or dessert, and I would be remiss if I did not suggest a little crumbled, crisp cooked bacon garnish on top if you want to go there. Next time I know I will. 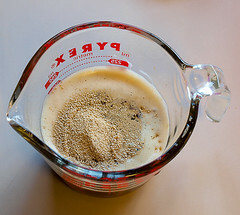 In a small bowl combine the ale, yeast, and brown sugar. Let stand for 10 minutes to activate. 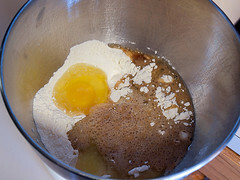 Once the yeast is foamy add it into the work bowl of a stand mixer along with the butter, salt, mace, milk powder, egg, and bread flour. 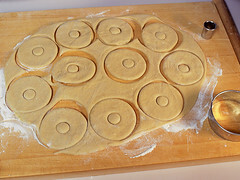 Mix the dough with the dough hook on low speed for three minutes. Test the hydration by touching the dough. If the is very wet, and when touched instantly sticks to your fingers, add more flour a tablespoon at a time until the dough feels sticky but only clings slightly to your fingers. 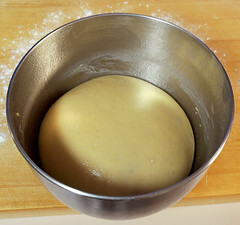 If the dough is dry, and not sticky at all, add water a tablespoon at a time until the dough is tacky to the touch. Increase the speed to medium and let the dough mix for 8 minutes. 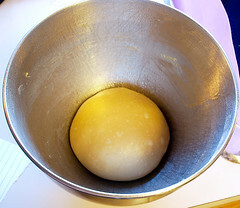 Turn the dough out onto a lightly floured surface and form into a smooth ball. Spray the work bowl with non-stick cooking spray and return the dough to the bowl. Spray the dough with the non-stick cooking spray and cover the bowl with plastic. Allow to proof until doubled in size, about 2 hours. 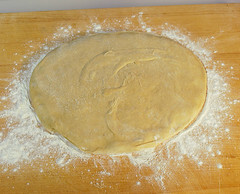 Once risen turn the dough out on a floured work surface and press out any large air bubbles with your palm. 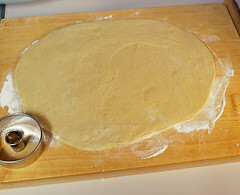 Roll out the dough until it is 1/4-inch thick. Cut out the doughnuts and allow to rise, covered, for one hour. 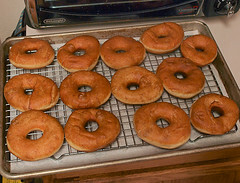 While the doughnuts rise prepare the glaze. Combine the gelatin with 1 tablespoon of the Black Ale. Allow to stand 10 minutes to bloom then melt in the microwave for 8 to 10 seconds. Combine the gelatin mixture with the remaining ingredients and whisk until smooth. Cover with plastic until ready to use. 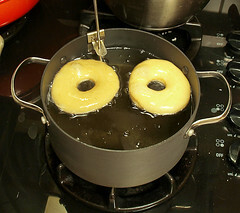 Once the doughnuts have risen heat at least three inches of oil in a deep pot, allowing for two inches of space at the top of the pan to prevent overflow, to 355 F. Fry the doughnuts for 45 seconds per side, or until they are golden brown and puffed. Drain on a wire rack and allow to cool for ten minutes before dipping in the glaze. 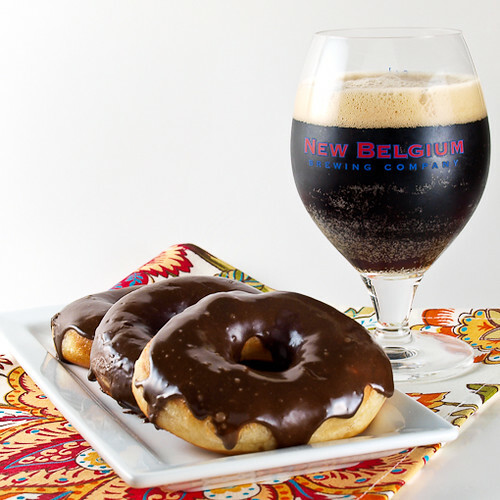 *Evil Shenanigans Product Review Policy and Disclosure– The New Belgium Brewing Company is providing me with a monetary stipend for providing this recipe. Any opinion expressed is my own and is not influenced in any way by the manufacturer/PR firm. I only review products that I have personally tested and endorse. © 2011 – 2016, Evil Shenanigans. All rights reserved.